It's been a week and a half since I got the phone call that Mr. Ed had suddenly gone to heaven. "It's All Gonna Burn" was his motto, and I even remember the DCC maintenance crew having shirts with this across the back. When I came out of the shock of hearing the news, my first thought was this passage, "Now the overseer must be above reproach, the husband of but one wife, temperate, self-controlled, respectable, hospitable, able to teach, not given to drunkenness, not violent but gentle, not quarrelsome, not a lover of money. He must manage his own family well and see that his children obey him with proper respect. " I really can't think of anyone who exemplifies everyone of these qualifications of a leader in the church better than Mr. Ed ... really, I can't. In our sinful world there are lots of leaders whom have needed God's grace on one or two of these. Believe me, I pass no judgment on such leaders, for they are some of the best. However, it is crazy to me that Mr. Ed needed no concessions. One man at his funeral said, "Mr. Ed always talked about his faults, but I never saw any." The only thing I ever heard Mr. Ed criticized for was being too humble. Funny, huh? Many close friends told stories and fond memories at his funeral, but I really couldn't help but wonder how many "Scott and Velvet's" there are -- those people who did not know Ed closely, but were grately impacted by his life, his work, his wife, his kids, and just being around him. I know there are hundreds. On the way home from the funeral, Scott and I discussed our regret for not going to visit them. Estes Park is not too far, and they extended the invitation every time we saw them. We are fools for not going. If anyone is interested, a memorial fund has been set up for Kara. We take seriously the responsibility to take care of widows. 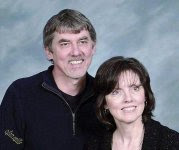 If you know Kara or knew Ed, and are interested, a donation can be made to Christian Church of Estes Park, 4655 US Highway 36, Estes Park, CO 80517. Put "Ed Schorstein Memorial Fund" in the memo. Through his death, Ed has said to me, "follow my example, as I follow[ed] Christ." I have acknowledged many ways that Ed taught me to live as a Christian. I will live differently. Rest in peace, Mr. Ed. Your life meant much to many. What a beautiful tribute.It makes one ponder what would be said at your own memorial. You are gifted at words dear Velvet. Love,KarenK. (aka,momasita) We hope to see you & your sweet fmly. during the holiday season! Thanks for that..I loved that man and am so grateful there is a memorial fund for kara. What an example. Mr ed was the bomb. I wore my work boots and flannel shirt while leading worship the sunday of his memorial!! He will be missed!! 'Tis often the smallest of God's gifts which prove to be the largest. The humility of one maintenance worker has grown a hundred-fold in a generation of ministry students whom he unintentionally impacted. This is Brian Wells, I used to work with Mr. Ed at DCC Maint. (with Jeremy, Todd, Spider, Arturo, Keith, Jean Claude, & Franeuo) My wife Nickole & I searched his name & found this. He will be missed. When he would tell us to go work he would say, "Carry on my wayward son." Carry on Mr. Ed. Can't wait to see you in heaven.